What sport complex(es) can be seen in this aerial? 1936. The layout for Roosevlet Raceway. Kudo question: Link the aerial to five Vanderbilt Cup Races. Roosevelt Raceway was the home of the 1936 and 1937 Vanderbilt Cup Races. A section of the temporary road that linked Ellison Road to the Motor Parkway for the the 1908, 1909, 1910 Vanderbilt Cup Race courses can be seen in the aerial. Congrats to Joe Oesterle, Greg O., Art Kleiner, Lee Chambers, Sam Berliner III, Tim Ivers, Steve Lucas, Frank Femenias and Frank Mendyk for identifying Mitchel Field and Roosevelt Raceway. Kudos to Greg O., Steve Lucas, Frank Femenias and Frank Mendyk for linking the aerial to five (maybe six) Vanderbilt Cup Races. At the top of the close-up, Roosevelt Raceway with the course set-up for the 1936 Vanderbilt Cup Race. 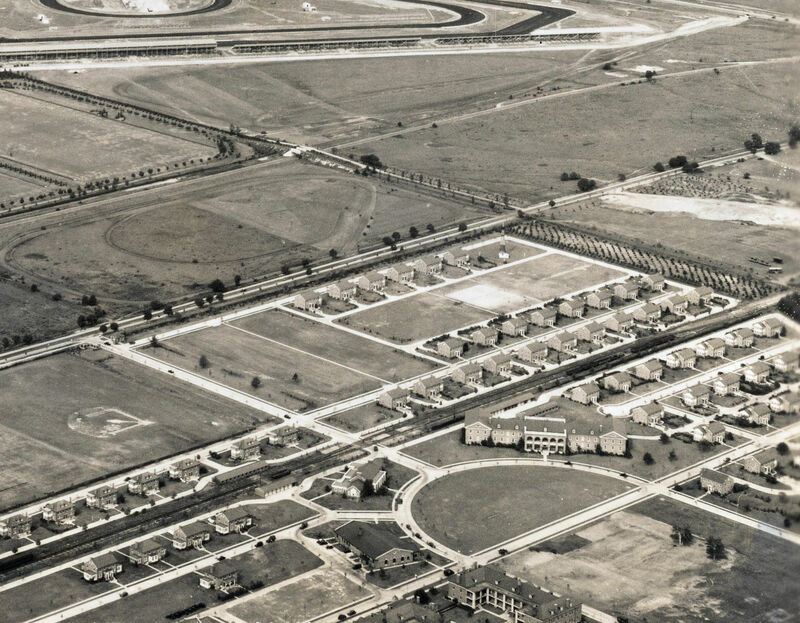 At the bottom of the close-up, buildings of Mitchel Field (See Lee Chambers' below comment). Many of the Mitchel Field buildings are still standing. There are two bridges over the Motor Parkway in this aerial: Roosevelt Field Motor Parkway Bridge and the Meadow Brook Club Bridge built by the club in the 1920s. Remnants of the temporary road that linked Ellison Road to the Motor Parkway for the 1908, 1909 and 1910 Vanderbilt Cup Races. Art Kleiner: In response to Lee's question about antenna towers at Mitchel Field, I've posted a comment in the blog and these photos. Lee Chambers: This was the inside of the small radio building at the end of Wheeler Ave. on Mitchel for Art Kleiner. From Mitchell Field, the current Nassau Community College looking NE. Stewart Ave, then the Motor Parkway run from left to right. The LIMP bridge at Roosevelt Field still stands. The red box shows the faint remnants of the road connector built for the 1908 VCR, to join Ellison Ave in Westbury with the LIMP. Looks like the race track used to revive the VCR’s of the 1930’s is peeking into the picture from the top. -What sport complex(es) can be seen in this aerial? -What is the date of the aerial? Provide a rationale. -Kudo question: Link the aerial to five Vanderbilt Cup Races. What sport complex(es) can be seen in this aerial? Meadow Brook Polo/Golf Roosevelt Raceway, I don’t think the baseball diamond would qualify as a sports complex. Kudo question: Link the aerial to five Vanderbilt Cup Races. 1936/1937/1960 Races held there. For the 1960 race, “Old Sixteen” from the 1908 race did a preliminary lap. Still missing one. One more Motor Parkway structure- the access from from the parkway to the viewing area for the Charles Lindbergh take off. Close up photo #1 shows the Central Railroad of Long Island line built by Alexander Stewart running directly through Mitchel Field, (though by then it had long been acquired by the LIRR) running parallel to duplex homes recently constructed along Ellington Ave. West (now torn down and replaced with condos) and Ellington Ave. East where the single family houses still stand today. These brick residential buildings were built during the Base Reconfiguration period occurring between 1927 - 1932 when massive construction replaced virtually all of the remaining standing wooden structures left over from Camp Mills in the WW I time frame. 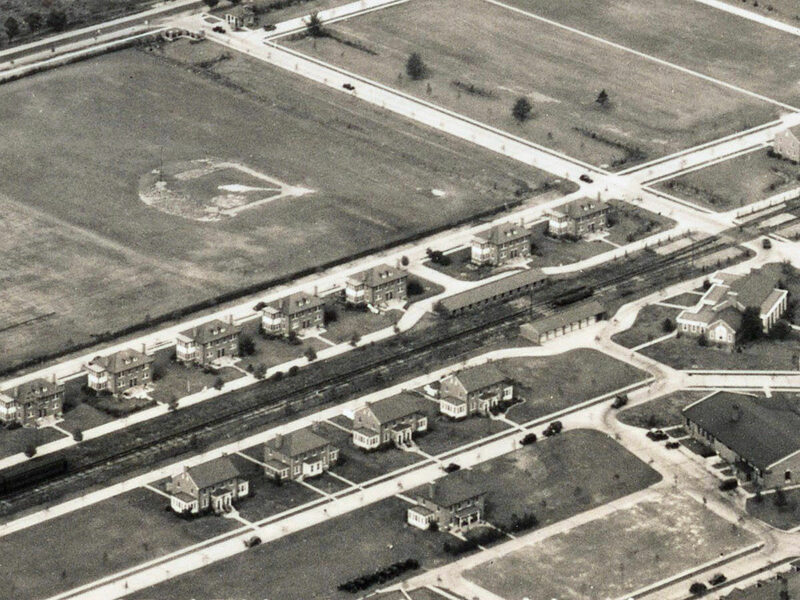 Notice how none of the future temporary wooden barracks north of Ellington are in place yet where the baseball diamond is, demonstrating this is from pre-WWII. Also seen in the shot near the bottom right is the Non-Commissioned Officers Club which would later be used as the Navy PX in the ‘60’s (sadly, that building although still standing has now been condemned) as well as the building that became the NCC Bookstore (which is currently undergoing a major renovation with a Starbucks-like structure inside it to be added soon). Selfridge Ave. runs up to the relocated Main Gate at Stewart Ave. Selfridge was positioned slightly to the West of the old main entrance as judged by the position of first house of East Ellington. 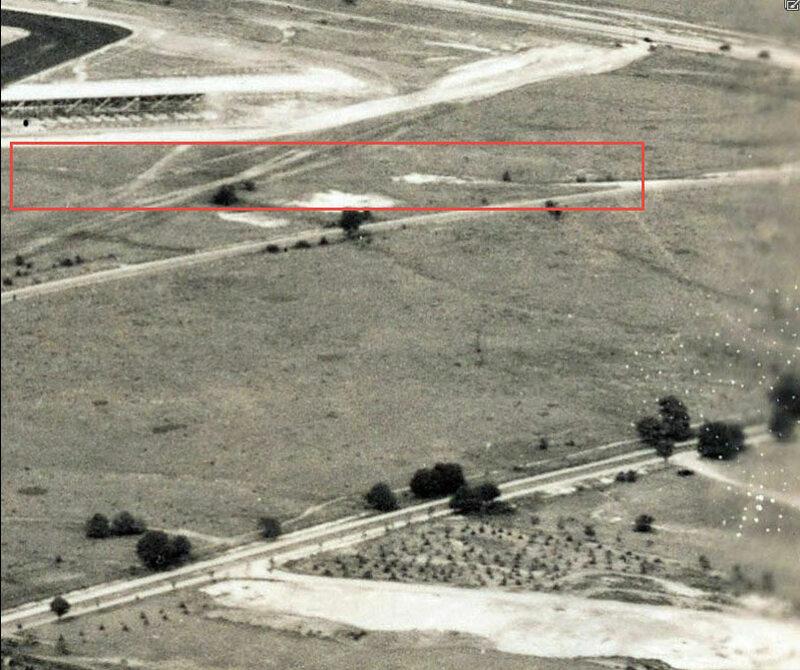 The blank lot next to it was where the roadway leading to the airfield proper was located originally. 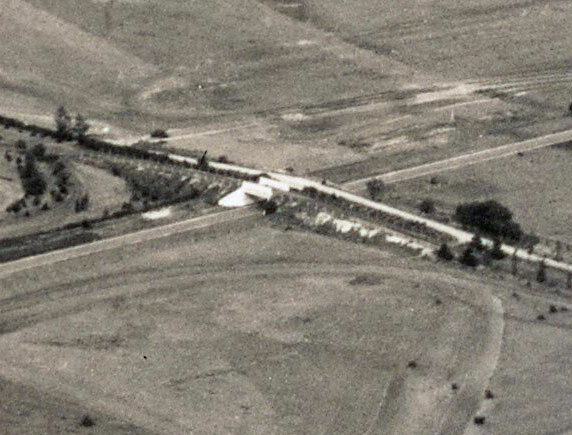 In close up photo #2, Bradley Hall, used for visiting single Airmen can easily be seen (though the bandshell in front of it in the semi-circle had not been created yet). Notice the two lone trees still standing on the Quadrangle / Parade Grounds (created as the focal point of the Reconfiguration and which did not exist prior to it) which had not been removed yet, suggesting again this photo is from from the same Reconfiguration period, circa 1930 or so. North of Stewart Ave, running parallel to it is the LIMP. The bridge crossing over the Parkway (better seen in close up photos #3 & #4) leading to the eastern portion of Roosevelt Field can be seen as well. Farther off in the distance, the grandstands of what became the original Roosevelt Raceway (for cars), leftover from the Vanderbilt races after racing on local surface streets was banned are seen. A portion of the elaborate looping course is visible too. The red outlined box in close up photo #5 would be the approximate area in which Charles Lindbergh took off from Roosevelt Field years earlier. All these aerial photos are looking to the Northeast from Mitchel Field towards Westbury and the Salisbury portion of East Meadow. Looking northeast over the east Garden City, Mitchel Field, Roosevelt Field area. Bottom right semi circle is the Mitchel parade grounds. The left to right diagonal just above the semi circle is the Stewart Line RR. The diagonal above that one is the LIMP. The housing area is the Mitchel Field complex. was built by the private Meadow Brook Club. At the top is Roosevelt Raceway. We’re over Mitchel Field looking north-north-east toward Westbury. We can see Stewart Avenue and the Central branch of the LIRR along with a small piece of Merrick Avenue in the upper right corner. I believe the housing complex is the officers’ quarters for Mitchel Field. The LIMP structures are the two side-by-side bridges over the LIMP connecting Stewart Avenue with Roosevelt Field. The sport complexes are: Meadowbrook Club Polo Field, Mitchel Field baseball field (a stretch, I know), and the Roosevelt (auto) Raceway. I think the date is 1936 because the track appears to be configured for the 1936 V.C.R. and not yet reworked for the 1937 race. Besides the site for the 1936 & 1937 Vanderbilt Cup Races, you can also see remnants of the temporary road connecting Old Country Road to the LIMP for the 1908, 1909, and 1910 races. I also think a case might be made for including the 1960 race course on land just below the grandstand near the upper left corner. The photo is taken over the Mitchell Field airbase, Garden City looking towards the northeast. Major roads - LIMP, Stewart Ave, Merrick Ave, Miller Ave, and Selfridge Ave.
1908, 1909, and 1910 cup races. The Roosevelt Raceway track was used for the 1936 and 1937 cup races. In close up photo #1, the remnant of the original main road leading up to Stewart Ave. can faintly be seen just to the right of Selfridge Avenue, running parallel to the three trees in a row. This road crossed the railroad tracks just to the East of the current crossing, then continued Southward across what would become the Quadrangle / Parade Grounds (which was occupied by numerous wooden buildings leftover from the Camp Mills days of WW1) to the airfield. In close up photos #2 & #3, at the extreme Eastern end of North Road, just after the last house on the right, a radio tower can be seen. (This would be just a few yards away from the public road that later became Endo Blvd.). Further research will need to be conducted to determine the purpose of the tower, though communication with incoming aircraft would seem to be the logical explanation. Best view of the twin bridges to date. Thanks Richard! Can’t get enough of this aerial. Lee - Amazing observation. I missed the (main road to Stewart Ave), yet it’s clearly in view. Fantastic work! Thanks for the info on the close-ups, Lee. 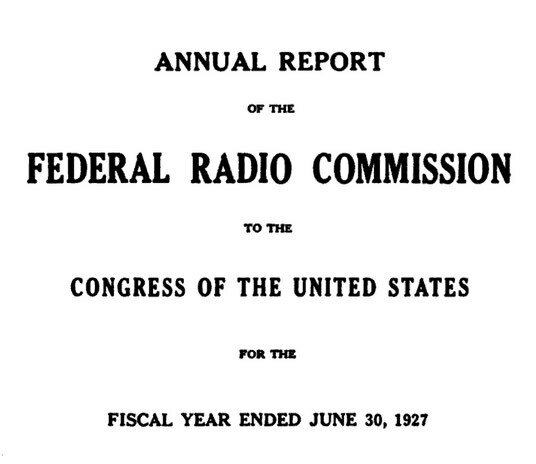 Having an interest in radio, I’ll be sure to do some research into the antenna. 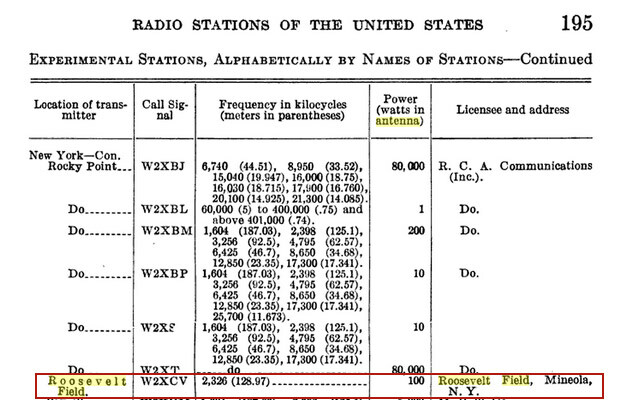 But so far I’ve found an experimental aeronautical radio station with call letter, W2XCV, being licensed to Roosevelt Field, Inc. (Mineola) with listings in govt. 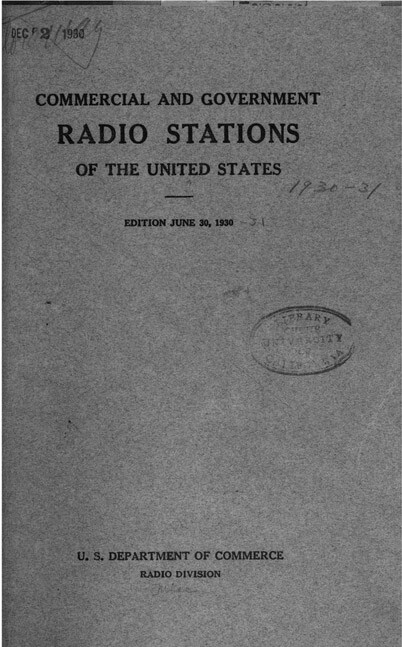 publications in 1927 and 1930. Not certain if these are related to the tower you point out. 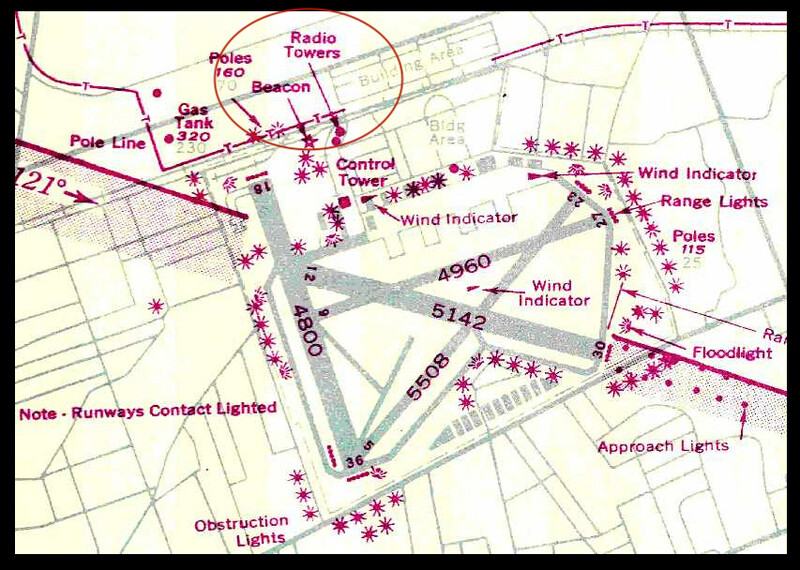 Also, there are radio antennas shown on a previously documented map of Mitchel Field on Howard’s blog and elsewhere. I’m sending Howard some pics and docs which I’m hoping he’ll post here to add to the discussion. More to come, hopefully. Update #1: Art Kleiner added new images and documentation. Thanks, Art. I recognize the map of the radio towers at Mitchel, though it appears to be sometime after the photos of 1936. I believe those were the towers located at the Western end of the Base just West of Wheeler Ave.
A small brick building adjacent to the gas station is where the radio communications room was located. From here, planes still at some distance away were given instructions on landing prior to contacting the air traffic control tower. The towers were located in the field between the gas station and the building that today still serves as the Navy Commissary, near where the coal silos once stood next to the spur of the railroad tracks that lead to the flight line (where the Ringling Brothers Circus used to unload from). 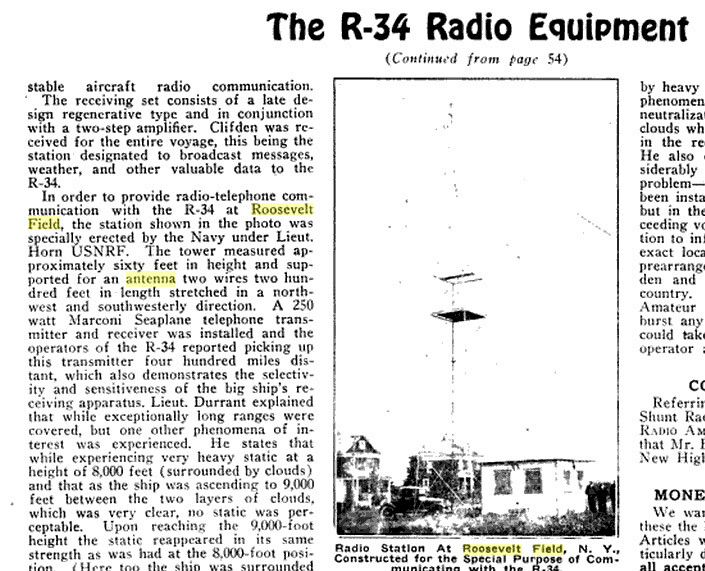 As for the station at Roosevelt Field, the article mentions the R-34 Dirigible that visited from England at the time. I do not know if that experimental station was ever granted a permanent license thereafter. Update #2: Lee Chambers has added a photo. The modern day educational radio station referred to is most likely WHPC-FM at NCC which since its founding in 1972 has been in the basement (actually the morgue) of the Base Hospital on (where else) Hospital Road at Mitchel Field where I got my start in broadcasting 42 years ago! The antenna was originally co-located with Channel 21 WLIW-TV’s tower at the end of West Ellington Ave. In exchange, Nassau donated space for studios and offices on campus for the educational TV station. When 21 moved out further on the Island, WHPC-FM erected it’s new tower on top of the administration building on Nassau’s new campus, which as President of the school from 1965 - 1979, my father oversaw the construction of the entire facility. The tower seen in the photos above was long gone by the ‘60’s and was definitely Military, not commercial in nature. Sam - thanks for bringing up the mystery electronics installation at OBVR once again - I clicked into your page about it and saw you used my material about it from years ago. I’m sure I knew you had used me as the source but thanks again. I’ve been back there every few years and my latest a few years back saw that all the equipment had been removed, taken, swallowed up by some govt. agency, etc. I actually found my notes about what was there originally - if anybody cares, there was a Radio Transmitter Model 15XLA (make unknown), an Aer-0-Com Automatic something Model ACB, antenna tuner Model ATU-100R, Power modulator Model XLA, a control voltage and a time sharing unit TSC. 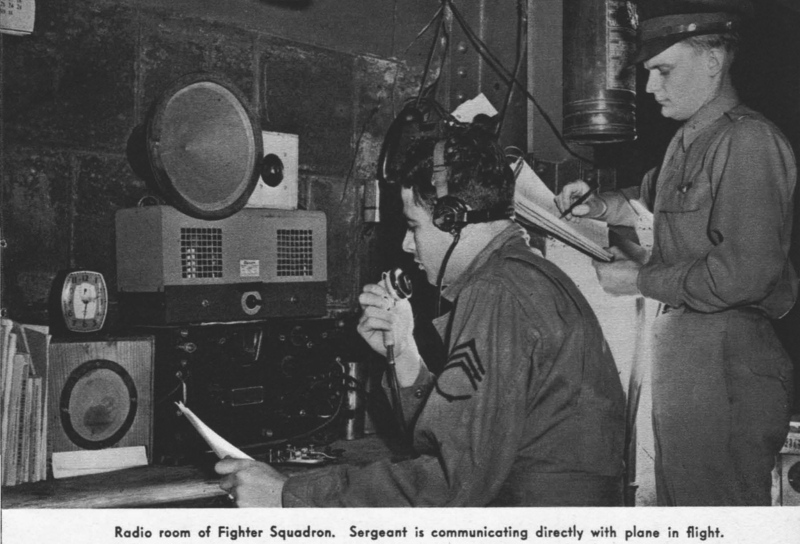 I believe most of the equipment was made by Aeronautical Communications Equipment Inc. of Miami Fl. My sole relic taken as a souvenir is a metal plate stamped with “Grumman Aircraft Engineering Corp. 61298”. I haven’t done any research about it in a while but thanks to you, I’ll be doing some real soon.